TypeEngine themes are a collection of one or more article templates that can be used to create and style complete issues of a digital magazine or newspaper app. Please refer to the following guidelines before submitting your TypeEngine Theme. Submissions must include one or more article templates packed in ZIP format. The number of unique article templates must be stated in the item description. Submissions must include an app-styling JSON file that sets the design options for the app’s menus. Optional PSDs may be included to allow users to customize template images. Item previews must include rendered screenshots of the demo publication from the TypeEngine preview app, showing the app menu styling as well as all of the included article templates in entirety. Please note, each article template screenshot must be a single seamless image. Use only relative paths in your index.html file to link to all of your assets. Issues of TypeEngine magazines are downloaded in their entirety. This is because many people enjoy reading issues in contexts where there is not a network connection. For this reason, it is not advisable to rely on assets or dependencies that require a network connection. Always reference local assets in your article templates. All template tags must be used within conditional blocks. Article templates must follow the TypeEngine development best practices found here. 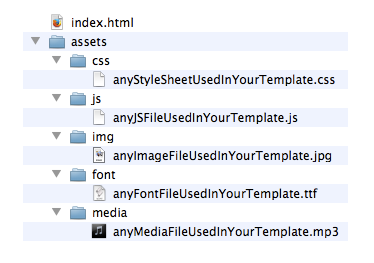 Be sure to declare an HTML5 doctype at the beginning of your template file. The character set meta tag must be declared in the head of your template file. The viewport meta tag must be declared in the head of your template file to ensure your template’s scale and zoom level is correct. Article-specific user defined CSS must be supported in your template file. Template design must not result in any conditions that will cause horizontal scroll. Template design must be compatible with both vertical (portrait) and horizontal (landscape) device orientation. Retina support is strongly encouraged, but not required. You must provide sufficient documentation to help customers with installation and setup. The full installation process of the theme must be documented. Sample content and styling/layout instructions must be provided for each article template. Download the preview app for free on the App Store. Log-in to the preview app with your TypeEngine credentials. The preview app now transforms into a live preview of your app. Navigate to your article to preview. Download the TypeEngine starter article template from GitHub.